The Wine & Gold called on Cavs fans to submit nominations of deserving unsung heroes to be named the 2018 Cavs EveryFAN and they delivered! From hundreds of nominations, Tequila Pennington-Calwise of Cleveland has been selected as the sixth annual recipient of the Cavs EveryFAN honor and was celebrated at halftime during the Cavs vs. Indiana Pacers game on Friday, January 26, 2018 at 7:30 p.m. Please click this link to read more and watch the video shown at the games halftime. ​​​ Click the Link BELOW! Lady Bound Featured on WKYC News! WKYC News searched the area for Cleveland's Everyday Champions and found Tequila Pennington-Calwise and Lady Bound! The video clip featured in the link below shows the special segment created to honor Mrs. Calwise and Lady Bound! Mrs. Calwise Honored in Essence Magazine! Mrs. Calwise is the "Verizon Wireless Everyday Hero"! Stephanie Williams Honored as CAVS Kid! Stephanie Williams (Lady Bound member) was honored by the Cleveland Caveliers as the Cleveland CAVS Kid. Stephanie was chosen because of her positive attitude, helpful nature, good grades and enduring strength during the death of her mother. Stephanie is a wonderful example of love, faith and courage. 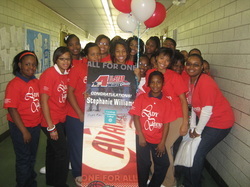 We salute our sister Stephanie Williams as Cleveland Cavs Kid! Lady Bound Thanked by Cleveland Mayor Frank Jackson! 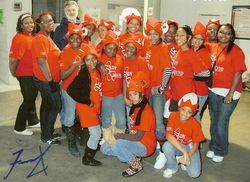 Cleveland Mayor Frank Jackson thanked Lady Bound for their volunteer time at the Cleveland Food Bank. Lady Bound members met at school at 6:00 AM on a very cold Saturday morning (14 degrees) waiting for our school bus to transport us to the Cleveland Food Bank. We packed large sacks full of food for needy families and then helped deliver the heavy sacks to each person's car. Two Lady Bound members (Ernestine Williams and Stephanie Williams) were chosen to attend a luncheon with the legendary Bill Cosby. The girls were treated to a three course meal and meet with Mr. Cosby before the luncheon attended by hundreds of Clevelanders. Mr. Cosby was so impressed that me mentioned Stephanie and Ernestine in his speech to the crowd. After the luncheon, they posed for a photo with Cleveland Schools CEO Dr. Eugene Sanders. 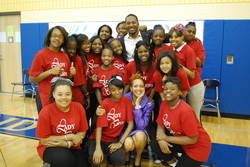 Lady Bound members were eager to welcome nationally known motivational speaker Mr. Basheer Jones to Euclid Park School. Basheer is a graduate of Cleveland Public Schools, a radio host, motivational speaker, best selling author and mentor. Included in the photo is Principal Chenita Williams. Mrs. Pennington-Calwise's sorority sisters, members of Alpha Kappa Alpha Sorority Incorporated. Inc volunteered twice per month with Lady Bound. They scheduled guest speakers, planned interesting fun-filled lessons, provided healthy snacks and engaged in meaningful conversations with the girls at Euclid Park School. This partnership fostered into valuable contact time for the girls and the AKA mentors. The members of Lady Bound were awarded certificates of participation at the annual Alpha Kappa Alpha Sorority Salute to Excellence Ceremony. Mrs. Calwise as guest speaker for "Strong Conference 2013"
Mrs. Calwise was a guest speaker at the National STRONG Conference in Atlanta, Georgia in March 2013. STRONG is an non-profit organization created to give women the tools and support necessary for personal, business and professional growth. STRONG is designed to inspire a generation of women to redefine their life's journey and identify their vision, purpose and passion. STRONG works to promote the importance of women creating their own future and understanding the power they hold not only in business, but in life. The STRONG Conference was held March 29-30, 2013 in Atanta, Georgia.